You guys. You need to make this macaroni and cheese. 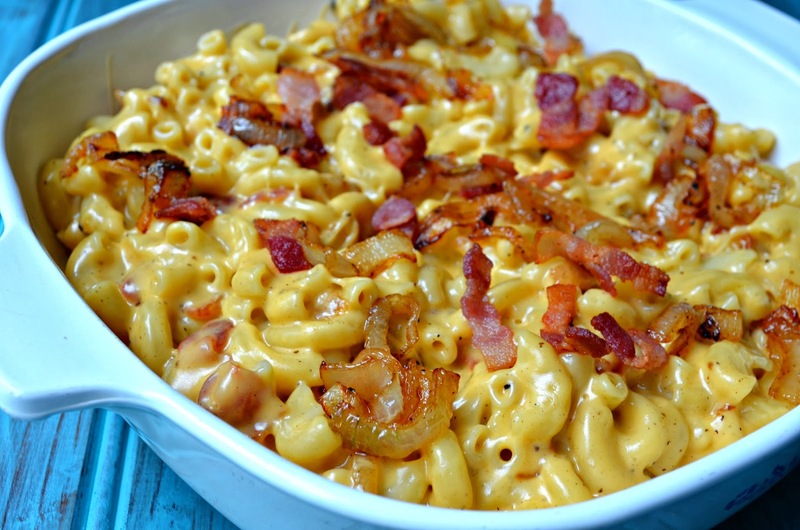 The basic recipe is so simple to make, but by adding two of my favorite things to my already addictive macaroni and cheese makes it out of this world. I also added extra cheese and decided not to bake it to make sure it kept the super creamy texture. It's so decadent and I'm obsessed. This was a simple idea. I was craving macaroni and cheese and had some leftover bacon on hand, so I decided to toss it in before it went bad. Since I was already changing the flavor profile a little, I figured I should go all out and add my other favorite thing...caramelized onions. I don't think I can ever go back to regular macaroni and cheese again. This was amazing. Enjoy! Cook pasta for 6-8 minutes, until al dente. Drain and set aside. Meanwhile, cook bacon in a large dutch oven over medium heat. Remove when done and drain on a paper towel-lined dish. Add onions to the dutch oven with bacon grease. Cook until caramelized, about 10-15 minutes, stirring often. Remove onions when done and set aside in a bowl. Drain remaining bacon grease. Melt butter in the same dutch oven. Gradually add in flour, whisking constantly. Immediately add salt, ground mustard and black pepper. Stir until well blended, about 1 minute. Slowly add milk to butter mixture, stirring constantly. Scrape up brown bits on the bottom of the pan. Bring to a boil and let boil for about 2 minutes. Lower heat and continue to cook over medium-low heat for 3-5 minutes, stirring constantly. Slowly add in cheese, stirring to combine along the way. Keep stirring until cheese is completely melted. 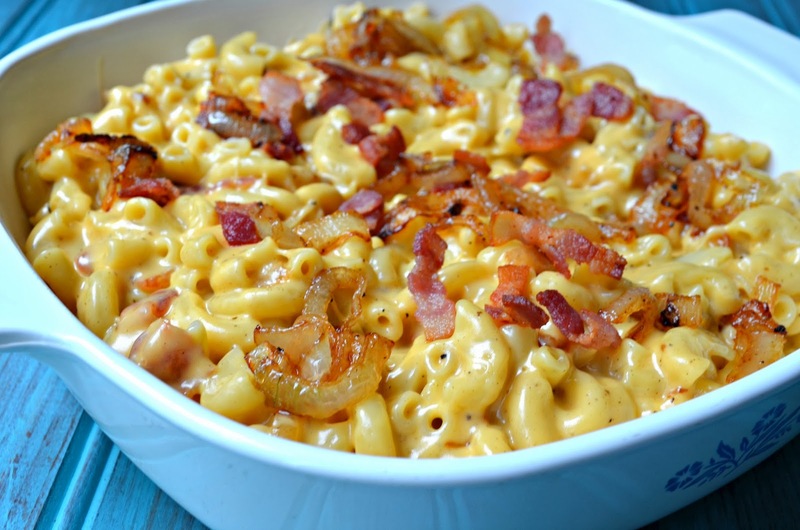 Once completely melted, add in cooked bacon and onions. Remove from heat and add cooked macaroni. Stir until combined. 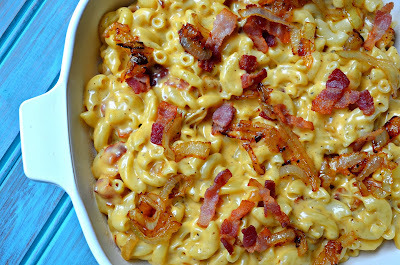 Add macaroni and cheese to baking dish. Serve immediately.